The Committee for the Redress of the Roma Holocaust in the Czech Republic represents the interests of the surviving victims of Nazism (especially former concentration camp prisoners) and the surviving relatives of the victims in the Czech Republic. Alongside many other activities, the Committee strives to see the victims compensated and to see the correction of the property injustices that were caused to Roma and Sinti people. Since its establishment in 1998, the Committee has fought to see the sites of the former concentration camps at Hodonín u Kunštátu and Lety u Písku in the Czech Republic become dignified memorials to the suffering of Romani people in Germany’s Nazi-era Protectorate of Bohemia and Moravia (called the Protektorát Čechy a Morava / Protektorat Böhmen und Mähren). The Committee initiates conferences, information campaigns and seminars. One of the association’s important aims is to inform the public, including Romani people, of the suffering of Romani and Sinti people during the Nazi era, as well as to discuss what acceptable models of interethnic behavior are with those living in socially excluded localities. Another aim of the work of the Committee is to contributing to settling and stabilizing relations between non-Roma and so that they become acceptable to both. More detailed information about the breadth and extent of the Committee’s activities are in the sections Projects and Contacts. Here are several documents related to the activity of the VPORH recently. we are a properly registered organization in the Czech Republic representing the interests of the Romani former prisoners in the Nazi concentration camps and their surviving relatives since 1998. 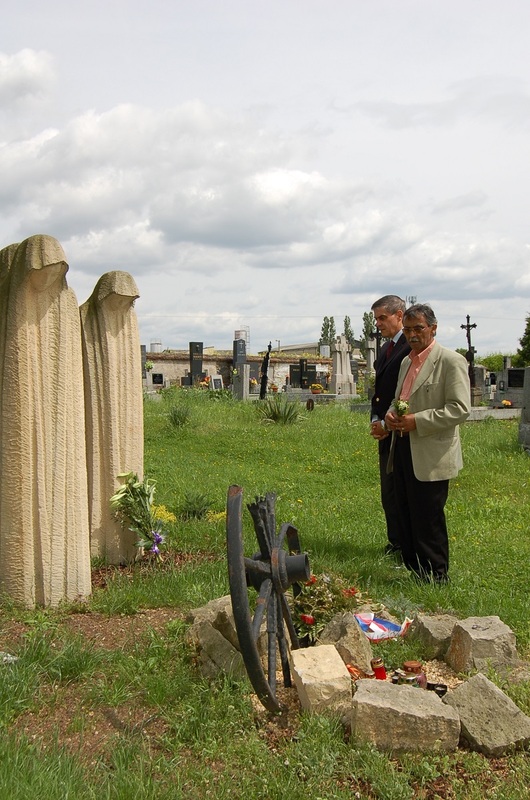 The members of our organization, who are Roma and Sinti who experienced the death of most of their loved ones during the Second World War, togther with those who have signed the letter below, express their deep concern and outrage over the fact that for decades the site of the former concentration camp for Romani People at Lety u Písku has been desecrated by the operation of an industrial pig farm. The stench of the pig excrement from the farm makes it impossible for the victims of the camp buried near the farm to be honored with dignity. We consider both facts to be a gross insult, not just to the relatives of the victims and the victims themselves, but to the Romani nation as a whole. International treaties, together with their additional Protocols, oblige the Czech Republic to preserve, in a dignified state, significant locations where the victims of Nazism suffered. The site of the Lety concentration camp, where 326 victims perished, including 241 children, during the Nazi era in inhumane conditions is considered a significant place of suffering of the victims of Nazism by the European Parliament and many leading world figures. This is documented by two resolutions of the European Parliament, one from 2005 and one from 2008, and also by statements made by many world-famous figures such as Nobel Prize winner Günter Grass and Simon Wiesenthal. Human Rights Commissioner for the Council of Europe Thomas Hammarberg also asked the Czech Republic to remove the farm in his assessment report of the human rights situation in the country. Permit us to recall that of the 6 500 indigenous Czech Roma and Sinti living on the territory of the Protectorate, roughly 650 survived their suffering in the concentration camps. A total of 326 Roma and Sinti perished at the Lety camp, 241 of them children. During the postwar years, nobody was ever convicted and punished for the crimes committed at the Hodonín camp (a similar camp for Moravian Roma) or at the Lety camp. One trial took place with the former commander of the Lety camp, Josef Janovský. In 1948, the court acquitted him. None of the other persons responsible for the criminal deaths of hundreds of people were ever tried. Concentration camp survivors and their relatives disagree with the allegations made by previous Czech Governments that removing the pig farm is a significantly difficult matter both economically and socially. Precisely the opposite is the case: We are convinced that because society is aware of the relationship between the Protectorate and our people, our proposal for a way to address removing this degrading building from the site of the former concentration camp would be welcomed by society with relief and thanks, as recently happened in the case of the closure of the recreation center at a similar site in Hodonín u Kunštátu. We remind you that the intention to remove the industrial pig farm standing on the site of the former concentration camp has been declared not just by the Program Declaration of the Tošovský cabinet in 1998. A similar intention was also expressed by a resolution of the Zeman cabinet, and particularly by a resolution of Špidla’s cabinet in 2002. The demand to close (remove) the farm, last but not least, is also a part of the program documents of your Czech Social Democratic Party (ČSSD). the surviving relatives of the victims know a feasible way to redress this. Should you decide to seriously address this problem, I am willing to visit you together with other surviving relatives to present our ideas for resolving this. Dáša Šubrtová, Antonie Šubrtová, František Šubrt, Věra Steinová, Jan Stein, Jan Růžička, Antonín Růžička, Filomena Růžičková, Anna Richtrová, Rudolf Richtr, Robert Berousek, Karel Berousek, Hana Berousková, Anna Pehová, Jan Peha, Jan Růžička, Hana Nová, Libuše Pehová, Anna Pehová, Jana Kokyová, Marie Danišová, Miroslav Daniš, Josef Berousek, Jan Hauer, Čeněk Růžička, Čeněk Růžička ml., Pavel Růžička, Zoja Růžičková, Magdaléna Růžičková, František Janďourek, Jindřiška Vrbová, Jan Růžička, Marie Růžičková, Antonín Vrba, Antonín Hauer, Marie Hauerová, Karel Chadraba, Jan Serynek, Antonie Burianská. Forum CZ, o.s., Strana rovných příležitostí, Roma aven jekhetane, o.s, SRNMPK, o.s., Khamoro, o.s., Euroroma Hodonín. Part of this request includes a signature page with the names of the persons who identify with the text of this request which will be sent to you separately. on behalf of the Committee for the Redress of the Roma Holocaust in the Czech Republic (VPORH v ČR). We are also sending a similar request to the Czech Minister for Human Rights, Equal Opportunities and Legislation, Mr Jiří Dienstbier, and to the Czech Culture Minister, Mr Daniel Herman. the Annual Report of the Committee for the Redress of the Roma Holocaust in the Czech Republic for 2014 (pdf). The President of the Committee for the Redress of the Romani Holocaust in the Czech Republic, Čeněk Růžička, and a representative of the Central Council of German Sinti and Roma Romani Rose. I am glad I have been given the opportunity to speak at this closing plenary session. You will not find my name listed in the original program of this afternoon session, but I am glad the organizers of this conference have ultimately decided to make room for a Romani community representative here as well. In just a couple of hours, the Terezín Declaration will be adopted. Some believe this document is inadequate, others consider it the maximum possible. I would like to point out to you, however, that what Terezín symbolizes for Czech Jews is the same thing that is symbolized for our Roma and Sinti by the former so-called “gypsy camps” at Hodonín and Lety. While at Terezín the creation of a European institution will be announced tomorrow, at the site of the former campa at Lety, where our forebears died, an industrial pig farm remains. Just one-tenth of the Bohemian and Moravian Roma and Sinti who were imprisoned in the concentration camps survived. Despite that fact, we are still struggling for the public to acknowledge and comprehend that the Romani population was subjected to genocide during the war in Central Europe. It is a fact that this has been forgotten in many respects, even during the preparation of this significant conference. No Romani organizations are represented on its organizing committee, and our representatives were not invited to its working groups. The fate of our forebears is comparable to that of the fate of the Jews, however. The “Gypsy Camp” at Auschwitz was adjacent to the “Jewish Family Camp”. Our vehicles, family jewelry, livestock and pets, and our homes were also confiscated and sold, and the money made financed our destruction. I hope this conference will contribute to raising questions of property damage. The Government has not yet managed to respond to the letter we sent on this issue in February of this year. It is a great shame that Romani Rose was not able to speak here on behalf of the Central Council of German Roma and Sinti. His work has gained international recognition over the decades, but he was not involved in the preparations of this conference. However, I would like to repeat the appeal he made on Friday. The Terezín Declaration should not be silent about the shameful situation at Letyech, where for more than 35 years a pig farm has stood on the place where our forebears died. The delcaration should focus on places of Romani suffering and name them too!!! At a time when the activities of neo-Nazis are again growing in Europe, it is, in my opinion, important for the property and restitution questions not to cover up the main reason we are here. Millions of people who lost their lives under drastic conditions as a consequence of monstrous racial theories oblige us to join the fight for human rights so the message of our forebears’ suffering will contribute to a better society. Source: Czech Radio - Radio Praha.